Stage 5 of the Tour de France was long and rolling with over 2,300 meters of altitude gain. The course began in Cagnes-sur-mer and finished in the city of Marseille. The break group of the day included Astana's Alexey Lutsenko and built up a gap of over 13 minutes. The 2012 UCI U-23 Road Race World Champion of Kazakhstan shared the SRM race file below with the cooperation of SRM sponsored Pro Tour Team Astana. The 25 kilometer Team Time Trial took place today in the coastal city of Nice, France. The course was flat with technical turns and long straightaways to highlight the strongest teams. The Australian team, Orica GreenEdge, took their second consecutive Tour de France stage win with a time of 25:56. Omega Pharma-Quick Step was second by 1 second followed by Team Sky. 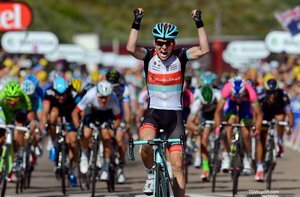 Stage 3 was the last of the stages held in Corsica, and ran 145.5km from Ajaccio to Calvi. After a hard day of racing and chasing down breaks, the peloton emerged from the climbing portions of the stage without the big named sprinters! Coming into the last straight away, Gerrans was led out by teammate Daryl Impey and launched his sprint at 200 meters to go. Able to hold off a charging Peter Sagan, Simone Gerrans took the win in a photo finish! Stage 2 of the Tour de France traversed the Corsica mountains and ended in a short uphill where RadioShack Leopard Trek’s Jan Bakelants held off the sprinters and won his first Tour de France stage. "I could see in the final that it’s going to happen and I knew I would probably also take this yellow jersey. Maybe it will be the first and the last time in my career, but today I wear it. I saw in the last 500 meters that I still had a gap and I told myself, ‘Come on, hold this. It’s going to be the nicest day of your life!’ And then I did it,” he said. 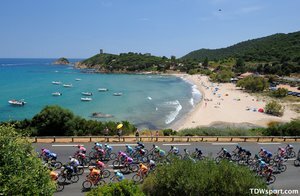 Stage 1 of the 100th Tour de France began in Porto Vecchio and stretched 213 kilometers up the coast to the finish in Bastia. The stage was "easy", flat, and a scenic beginning to the Tour. Power and speed in the peloton today was relatively low, but this will change tomorrow as the race heads into the mountains of Corsica. Despite the flat course the last kilometers became narrow and technical causing several crashes. RadioShack Leopard Trek's rider, Tony Gallopin, experienced a crash in this section, but thankfully was not injured and continued to finish with his team and share the SRM race data below.